Apollo 8 in 1968 was NASA’s perfect Christmas Mission that at the time awed and moved the whole world. Our forthcoming movie “Mission Control: the Unsung Heroes of Apollo” gives a new perspective on the flight from the consoles in Houston, and shows that Apollo 8 was also an extraordinary example of bold and strong leadership and remarkable teamwork. In the last two years I have had the privilege to be a producer on the upcoming new Haviland Digital movie Mission Control: the Unsung Heroes of Apollo, working with director David Fairhead and producer Gareth Dodds. We were inspired by Rick Houston, an expert in space history and the author of “Go Flight: The Unsung Heroes of Mission Control”. The film should be released around the spring of 2017. The film is about a remarkable decade of achievement by the people who worked at consoles in Mission Control in Houston. The team members were born against a backdrop of economic turmoil and global conflict. Some came from a rural lifestyle little changed from the 19th century. Others grew up in a gritty, blue-collar America of mines and smoke stacks. They ranged from kids straight out of college to those toughened by military service. But from such ordinary beginnings, an extraordinary team was born. “The most hazardous, dangerous, and greatest adventure upon which mankind has ever embarked”. Through their testimony – and the supporting voices of Apollo astronauts and modern NASA flight directors – the film takes us from the faltering start of the program through the Mercury and Gemini missions, the tragedy of the Apollo 1 fire to the glories of the Moon landings. In making the film, we had the immense privilege of spending time with these men, who had taken part in some of the greatest events of the twentieth century. And for many, it will be a new viewpoint – a viewpoint of the space program from the ground, not the capsule. Most of us, when thinking about that era, will come first to Apollo 11 – when Neil Armstrong and Buzz Aldrin were the first humans to walk on the lunar service. But almost universally, for those in Mission Control, their favourite mission was not the moon landing – extraordinary as that was – but the first journey to orbit the moon: Apollo 8. 1968 was a difficult year. In the world at large, it had started with the North Vietnamese launching the Tet offensive. It was also to be the year of the My Lai massacre. In April, Martin Luther King Jr. was assassinated. There were riots in Paris and Chicago, and a sense of revolution hung coldly in the air. In June, Sirhan Sirhan shot Robert Kennedy, and in the autumn, the Soviet Union invaded Czechoslovakia. It had also been a challenging period for NASA. In January of 1967, a fire had swept through the first Apollo capsule intended for space during a ground test. The fire was caused by a mix of bad wiring and a pure oxygen atmosphere. And because the escape hatch mechanism was clumsy, three astronauts lost their lives in horrible circumstances. The pain of that event is still felt fifty years later. It was an avoidable and unexpected body blow for the Apollo program – one that could have easily proven fatal. Flight Director Gene Kranz – famous for his core role in saving the Apollo 13 crew – had taken his team aside at that point and asked them to take and feel their own accountability, and then write on their blackboards the words tough and competent– a vow to do their best and strive for excellence, but also be willing to raise their hands when schedule and other pressures threatened a mission and its crew. So, 1968 for NASA was a year of recovery and regrouping. And many – including Dr Chris Kraft, the creator of Mission Control – came to think that period of recovery proved to be necessary and essential. With the tragedy and without the cold and clear response from NASA in improving things, the moon landings may not have happened. The main spacecraft was redesigned to a higher “Block II” standard. Flammable materials were eliminated from its interior. The hatch was made easy to open. The NASA leadership of the era passed the main test of real leadership: can you handle the bad times? The first success of this new phase was Apollo 7, where a three-person crew tested the main spacecraft – the CSM or Command and Service Module. This flew without a real hitch in Earth orbit in October 1968. It still wasn’t plain sailing. 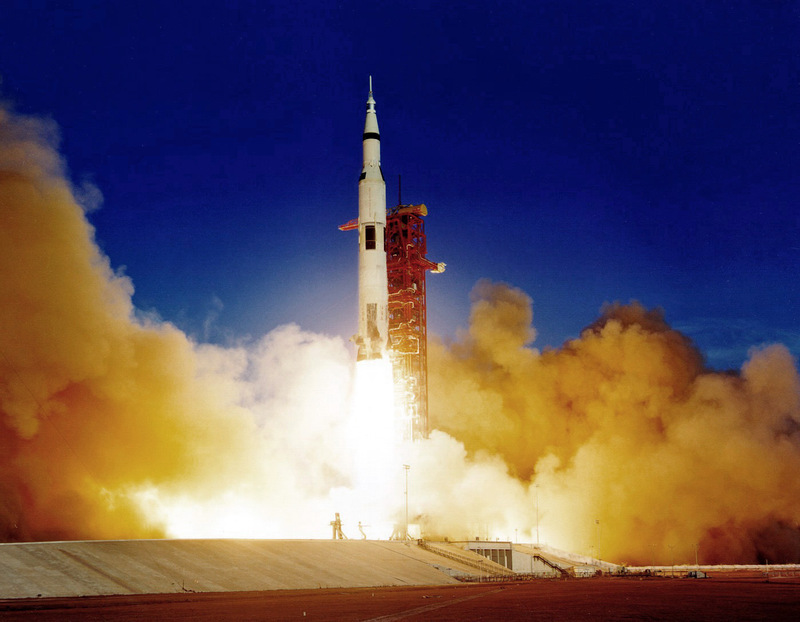 Apollo 6 – an uncrewed mission – had tested the mighty Saturn V rocket and it had turned out to be quite a ride. The launch was so violent that the rocket had “pogo-ed” , and any crew would have been injured or killed. The design was later changed so that helium gas was pumped into voids in the ducts leading to the F-1 engines to change the overall resonance characteristics of the vehicle. There were also issues that caused the premature shut-off of engines in the second stage, requiring another set of fixes. And then the lunar module – the spidery and fragile craft that was meant to land on the Moon – was proving to be “a horrible piece of hardware.” It was not ready. There were too many defects to meet the schedule. It would take many weeks to fix. And Apollo 8 was meant to test the lunar module in Earth orbit. The word agility is used a lot in modern business to describe approaches that can deliver results fast and handle change well. It’s a word that belongs to the 21st century. But NASA in the 1960s remains an example of agility that still startles. In the summer of 1968 and in a decision that would be remembered as an act of extraordinary vision and boldness, George Low, the Manager of the Apollo Spacecraft Program Office, proposed that Apollo 8 be instead sent to orbit the moon without its Lunar Module. This would be the first manned flight using the mighty Saturn V – a rocket that had just had its severe issues with “pogo-ing” fixed but not tested. It was a bold step indeed to use its first crewed flight to travel almost a quarter million miles to the Moon. Any trip to the Moon also required intense planning and training , and the discussions had started just a few weeks before the earth orbit Apollo 7 was scheduled to fly. It was a tough schedule to meet. Would it be even possible? So, the mission imagined on almost the spur of the moment rapidly gained the support of almost all NASA’s senior managers. They understood the immense morale boost it would create, and they had confidence in their vehicles. Above all, the team that had formed out of Mercury, Gemini and the early days of the Apollo program had gained immense confidence in itself. This great challenge could be met. This mission was possible. It was a Go! Training was started in September. No public announcement was made about the real intent of the mission until November 12, less than 40 days before launch. The news of the real goal of Apollo 8 stunned and exhilarated the public. American astronauts were going to the Moon … and at Christmas. On the morning of December 21, the Apollo 8 crew – Frank Borman, Jim Lovell and Bill Anders – was awakened in the small hours, and given a traditional breakfast of steak and eggs. As for Mission Control, it would operate 24×7 in three shifts, led by Flight Directors Charles Charlesworth, Glynn Lunney and Milton Windler. The atmosphere in Mission Control was intense. As Jerry Bostick remarks in the film, every thing was checked and rechecked. “This no simulation … was for real”. The countdown proceeded smoothly and at 7:51 AM, the four hold-down arms were released and the Saturn V moved slowly into the air, driven by many millions of pounds of thrust. It did not shake as violently as Apollo 6 and the crew were safe. 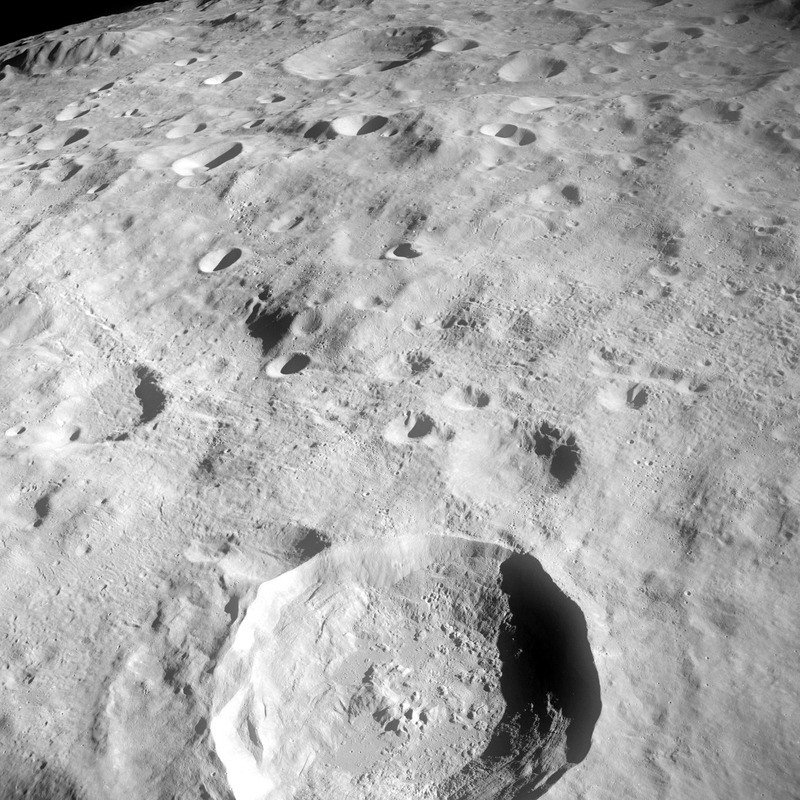 TLI stands for “Trans-lunar Injection”. It gave permission to the spacecraft to leave low-Earth orbit. The engine on the third and final stage of the Saturn V fired again. Apollo 8 was now the first manned interplanetary spacecraft. And the crew would find time to take the first pictures made by humans rather than robots of the whole planet Earth. As they approached the moon, the crew began to prepare for Lunar Orbit Insertion or LOI. This was a particularly tense moment. It depended on a burn of the service module engine on the far side of the Moon, when the spacecraft was alone and out of contact with Earth. Mission Control had set up two countdown clocks. If Apollo 8 regained contact at the first timing point, then no burn had happened and LOI had failed. If it regained contact at the second timing point, the burn had worked perfectly. Anything else was real trouble. The craft could be heading into solar orbit or towards impact on the lunar surface. The engine had performed as it should. Apollo 8 was in orbit around the moon. These were the words of pilots and engineers. Plain, without romance. But poetry was coming. Then Anders said crew had a message for all on Earth. It was at that moment that each of the astronauts read a section from Genesis, about the creation of the Heaven and the Earth. It had been selected as a part of the bible with resonance across multiple religions. The next critical moment was Trans-Earth Injection, or TEI. The service module engine needed to be restarted a second time, and perform another perfect burn. Again, that would be done behind the moon. After the long coast back to Earth, the Apollo 8 Command module re-entered the atmosphere with the fire and dreadful violence that comes from interplanetary velocities. The deceleration peaked at around 6g, as the spacecraft met the resistance of Earth’s atmosphere. At around 10,000 feet the three main parachutes slowed the Command Module, and it splashed down south of Hawaii. Apollo 8 of course is also extraordinary example of bold and strong leadership and remarkable teamwork. Coming less than two years after the Apollo 1 fire which could have halted the program, it represents true both organisational resilience and the genuine acceptance of accountability. NASA were truly “tough and competent”. It demonstrates adaptability, creativity and agility. Apollo 8 was meant to be an Earth orbit mission. The bold and courageous mission that replaced that original intent probably shortened the path to the Moon. It was a decision made quickly and decisively. It demonstrates the high performing team at the heart of NASA and Mission Control – who were able to create a new and complex mission plan for humanity’s first mission to another world in a matter of weeks. Apollo 8 was also a remarkable moment in communications, in PR and marketing. At the end of a deeply troubled year, its success bound together humanity for a moment. In summary, Apollo 8 is a perfect example of the power of vision and imagination, followed by perfect execution. And it happened at Christmas. This article is an extended version of an article first published in 2014. Many thanks for David Woods for insight into the Apollo 6 launch. Keith Haviland is a Former Partner and Global Senior Managing Director at Accenture, and founder of Accenture’s Global Delivery Network. He is also a film producer and CEO of Haviland Digital – dedicated to intelligent film, TV and Digital Media. Apollo 8 was NASA’s perfect Christmas Mission, which moved the human spirit. It was also an extraordinary example of bold and strong leadership, remarkable teamwork and commitment, agile and rapid program management, and brilliant, authentic communications and marketing. Apollo 8 represents leadership at its best. I’ve always been fascinated by the great cycles of humanity’s festivals – and their links to the patterns of our solar and lunar years, and to each other. I’ve often sent greetings that search for the meanings of such festivals. We are now a few days away from Christmas and its secular cousin of the New Year. For Christians, Christmas is of course a very direct celebration of the religion and its origins. But its date was set by Roman clergy from the 350s, and maybe earlier, to connect it to the ancient festivals of the Winter Solstice – which are in the end also about renewal and rebirth. For some Romans, the date of December 25st was the birthday of the sun god Sol Invitictus. In the north of Europe, people celebrated the pagan festival of Yule, which became synonymous with Christmas from the tenth century onwards. Many traditions linked with the non-spiritual side of Christmas – from greenery and trees from the North forest, through gift giving and feasting, to the miraculous powers of a bearded, benevolent godlike figure – have their ancient origins in these pagan festivals. But this year I wanted to celebrate Christmas with a modern twist, and look for a story that underpins some of the themes of Christmas, and resonates with my own interests and future plans – a story that would also be an inspiration. For me the choice is an obvious one: the Christmas flight of Apollo 8 in 1968 – the first time that humans would orbit and return from the Moon, and NASA’s perfect flight. It is a flight seen by many who took part in Apollo as the golden moment of America’s journey to the Moon – and perhaps its greatest mission. It is a story that covers vision, teamwork, renewal and a moment of spiritual reflection, looking down upon the Moon and the Earth. 1968 overall was an extraordinarily challenging and difficult year for the US and the West. It started with the North Vietnamese launching the Tet offensive at Nha Trang. It was also the year of My Lai. In April, Martin Luther King Jr. was assassinated. There were riots in Paris, and a sense of revolution hung coldly in the air. Later, there were riots in Chicago. In June, Sirhan Sirhan shot Robert Kennedy, and in the autumn, the Soviet Union invaded Czechoslovakia with a vast army, strangling the Prague Spring. It seemed an inauspicious year. The Apollo program also faced its own complex challenges as the deadline set by President Kennedy closed in. First had come the tragedy of the Apollo 1 fire in 1967, which had killed astronauts Gus Grissom, Ed White and Roger Chaffee. The defects in the Command and Service Module (CSM) spacecraft had been fixed remarkably quickly, and Apollo 8 was intended to test the Lunar Module or LM in low Earth orbit in December 1968. But the first lunar module turned out to be broken. When it arrived at Cape Canaveral, there were too many defects to meet the schedule. It would take many weeks to fix. In a decision that would be remembered as an act of extraordinary vision and boldness, George Low, the Manager of the Apollo Spacecraft Program Office, proposed that Apollo 8 be instead sent to orbit the moon without its Lunar Module. This would be the first manned flight using the mighty Saturn V – a rocket that had just had severe issues with “pogo-ing” fixed. It was a bold step indeed to use its first manned flight to travel almost a quarter million miles to the Moon. Any trip to the Moon also required intense planning and training flight, and the discussions had started just a few weeks before the earth orbit Apollo 7 was scheduled to fly. It was a tough schedule to meet. Would it be possible? So, the mission imagined on almost the spur of the moment rapidly gained the support of almost all NASA’s senior managers. They understood the immense morale boost it would create, and they had confidence in their vehicles. Above all, the team that had formed out of Mercury, Gemini and the early days of the Apollo program had gained immense confidence in itself. This great challenge could be met. This mission was possible. It was a Go. Training was started in September. No public announcement was made about the real intent of the mission until November 12, less than 40 days before launch. The news of the real goal of Apollo 8 stunned and exhilarated the public. American astronauts were going to the Moon. 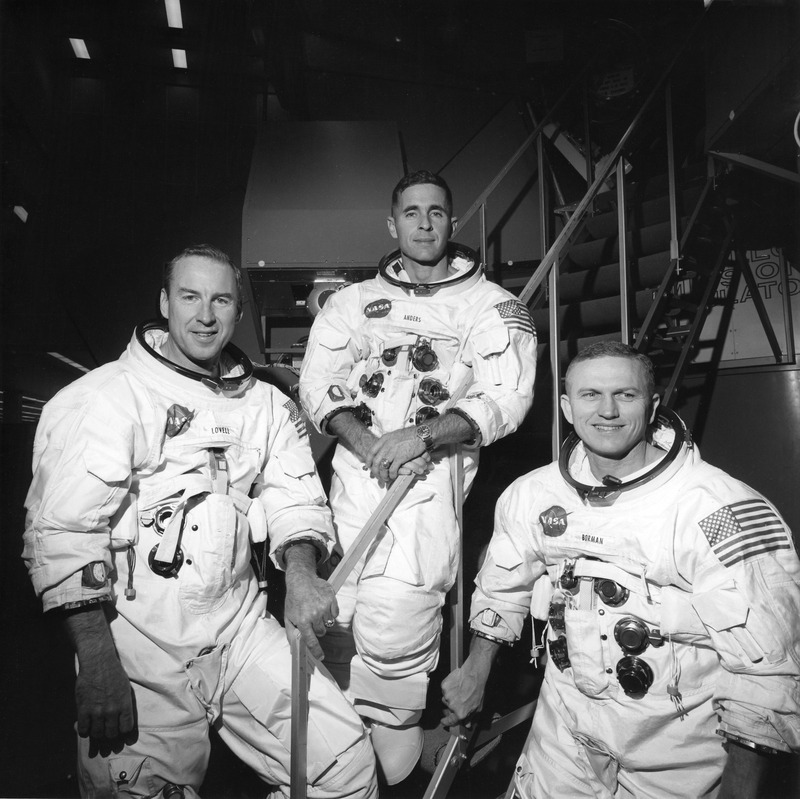 The crew consisted of Frank Borman, Jim Lovell and Bill Anders. For Borman and Anders, this was to be their last spaceflight. 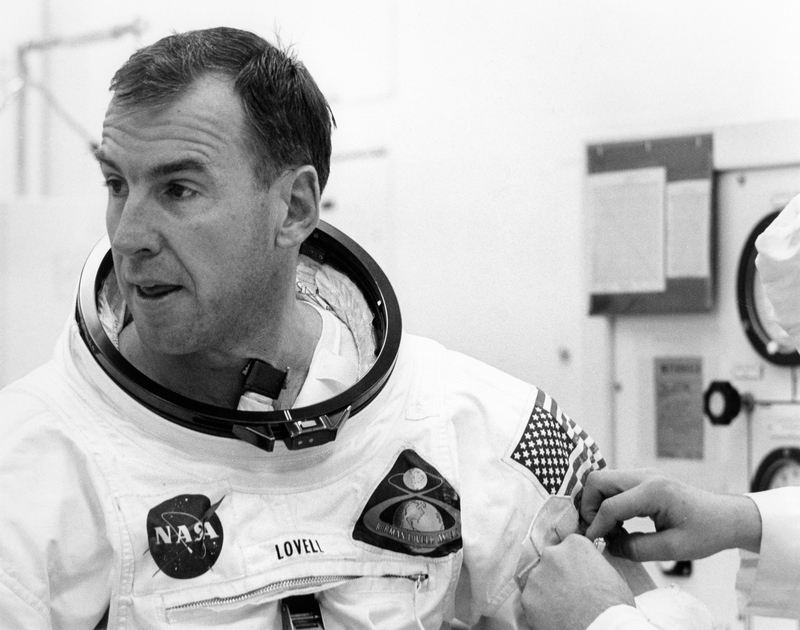 Lovell would be the commander of Apollo 13. They were a good crew admired by those who supported them, and became well prepared at short notice for a mission of an entirely new kind. Mission Control would operate 24×7 in three shifts, led by Flight Directors Charles Charlesworth, Glynn Lunney and Milton Windler. On the morning of December 21, the Apollo 8 crew was awakened in the small hours, and given a traditional breakfast of steak and eggs. The countdown proceeded smoothly and at 7:51 AM, the four hold-down arms were released and the mighty Saturn V moved slowly into the air, driven by many millions of pounds of thrust. Astronaut Michael Collins was the CAPCOM (Capsule Communications) on duty and at 2 hours, 27 minutes and 22 seconds in the mission radioed, “Apollo 8. You are Go for TLI.” The engine on the third and final stage of the Saturn V fired, and pushed out of Earth orbit. Apollo 8 was now the first manned interplanetary spacecraft. Mission Control had set up two countdown clocks. If Apollo 8 regained contact at the first timing point, then no burn had happened and LOI had failed. If it regained contact at the second timing point, the burn had worked perfectly. Anything else was real trouble. It was at this point that Lunney – who was the flight director on duty, said: “Okay, all flight controllers, this is a good time to take a break.”. It amazed the members of Mission Control at first, but on reflection there was nothing to be done for around 20 minutes. Some of them took advantage. Eventually, the first countdown clock expired. There was no signal. Tension in Mission Control increased. The engine had worked as it should. Apollo 8 was in orbit around the moon. It was then that the crew could start observing another world – one of the prime purposes of the mission, and essential preparation for future landings. They would take many hundreds of photos. But it was not the Moon that was to get the most attention. One of the key moments of the flight, and indeed all of history, came as the craft emerged from behind the Moon for the fourth time. 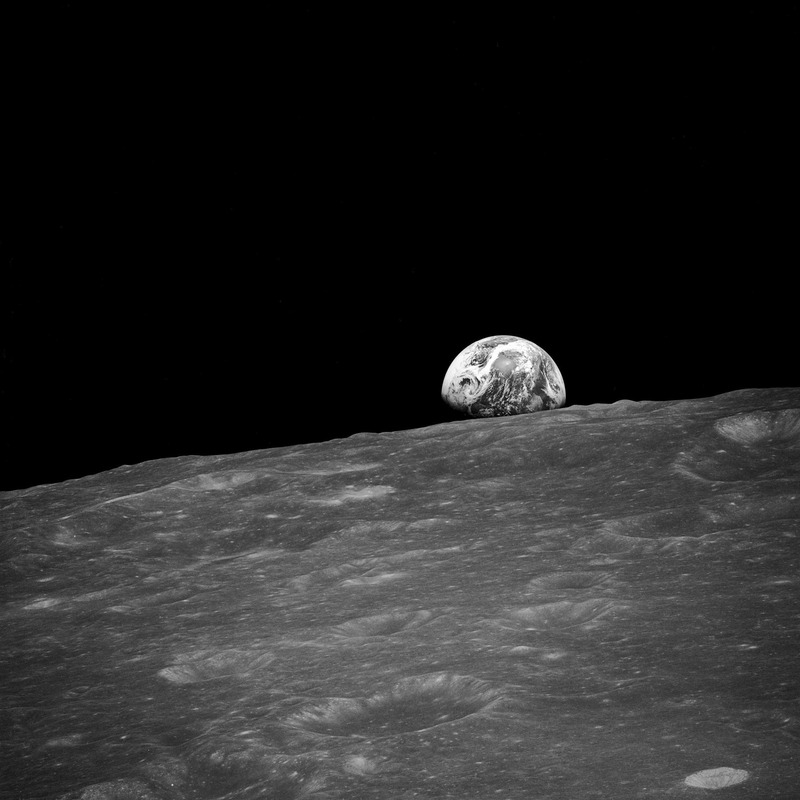 The crew witnessed “Earthrise” for the first time – the crescent of our plant rising above the limb of the moon’s broken surface. Borman noticed first, and called in excitement to the others, taking a black and white photo as he did so. Anders took another, now famous color photo, later selected by Life as one of its 100 photos of the century. Then Anders said crew had a message for all on Earth. It was at that moment that each of the astronauts read a section from Genesis, about the creation of the Heaven and the Earth. After the long coast back to Earth, the Apollo 8 Command module re-entered the atmosphere with the dreadful violence that comes from interplanetary velocities. The deceleration peaked at 6g, and – as planned – the spacecraft bounced like a skipping stone before falling to the Pacific Ocean. 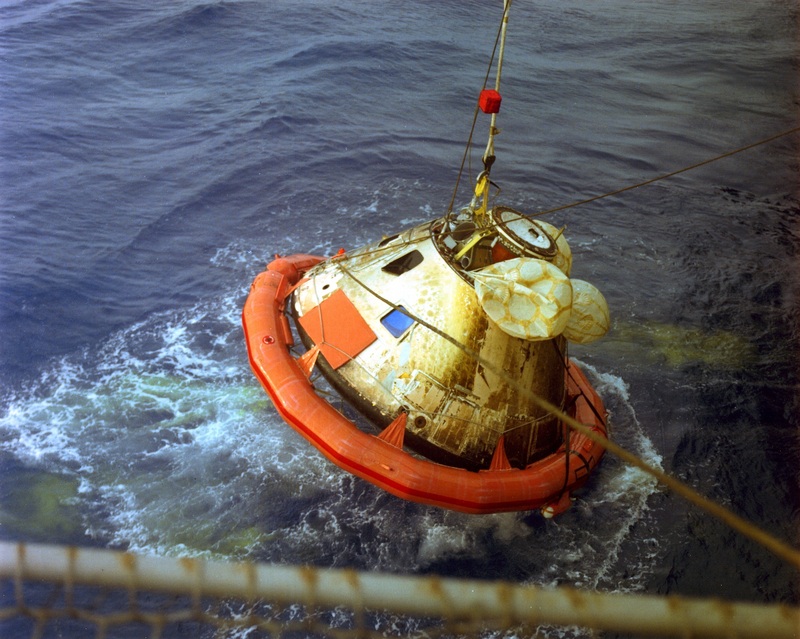 Apollo 8 Command Module being recovered after splashdown. In the end, Apollo 8 was a genuine and complete success. It was indeed a perfect mission. Beyond the magnificence of the technical achievements, there are many leadership lessons. Apollo 8 is a perfect example of the power of vision and imagination, creating a new mission of historic importance out of issues. It would not have been possible with the preparation already undertaken, and the intense commitment and teamwork of the extraordinary team that had formed around mission operations. Apollo 8 was also a remarkable moment in communications, in PR and marketing. At the end of a deeply troubled year, its success bound together humanity for a moment as would Apollo 11 and Apollo 13 in coming months. And perhaps most importantly, each of those who witnessed Apollo 8 through the media of the day got to see our fragile home from afar. Apollo 8 was NASA’s perfect mission. It shows the value of imagination and bold vision. It was founded on teamwork. It enabled all of us to look at ourselves in a different way. Merry Christmas and a Happy, Bold and Successful New Year to all of you.